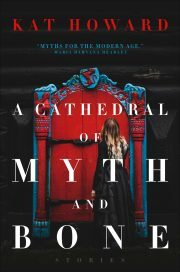 Kat Howard’s A Cathedral of Myth and Bone is a collection: fourteen short stories, one novella, and one novelette. She is also the author of several well-regarded novels, which I reviewed here. 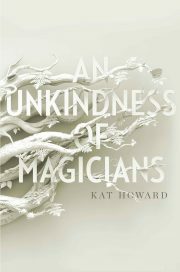 Kat Howard’s 2017 An Unkindness of Magicians is a standalone urban fantasy. Every twenty years, the magical houses of New York City’s Unseen World struggle for dominance in a series of increasingly dangerous contests known as the Turning. This time, the Turning is seven years early. The premature Turning is just one of the disquieting anomalies plaguing the Unseen World. Which may hint that magic itself may be dying. 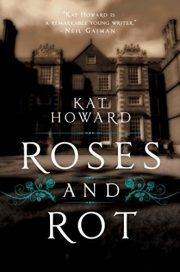 2016’s Roses and Rot is Kat Howard’s debut novel. Imogen and Marin have a nasty mother, an insidiously spiteful mother, a mother worse than an evil step-mom. Imogen escapes domestic torture by enrolling at a distant school that is so prestigious that her status-conscious mother cannot bring herself to cut off that escape. But Marin does not have the option (much to Imogen’s distress; she does not want to abandon her sister). Marin has to escape on her own, which she does indeed manage. She becomes a dancer. Years later, both sisters win fellowships to an artists’ colony, Melete. It’s a chance to reconnect. It also turns out to be an encounter with fairy danger.